The 23 km long Zulg river drains a total of 89 km² of the Swiss Prealps near the municipality of Steffisburg in the canton of Bern. 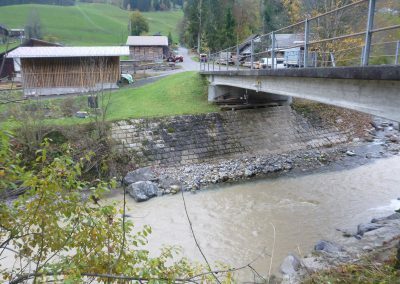 In the Zulg catchment, heavy local precipitation is not uncommon, leading to a fast reaction of the water level downstream. In 2012, a flood brought large amounts of driftwood into the Steffisburg area, presenting an additional threat. Local authorities asked Geopraevent to design an alarm system specific to the requirements at the Zulg river. 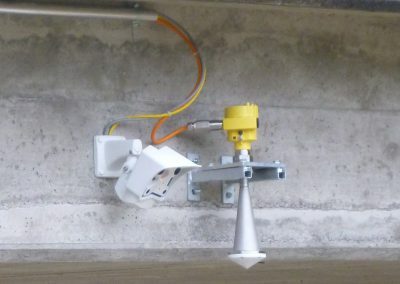 The warning and alarm system installed in 2013 consists of a modern radar gauge and a webcam. The radar gauge continuously measures the water level of the Zulg and sends the data to the Geopraevent data portal. The webcam image acquisition rate is increased when the hazard level is high, and a live function lets users trigger the camera when they need an image. On the data portal, past and current water level data and images can be accessed from any smartphone, tablet or computer. The water level graph and the webcam images are linked so that the corresponding webcam image can be seen when moving the mouse over the water level graph. 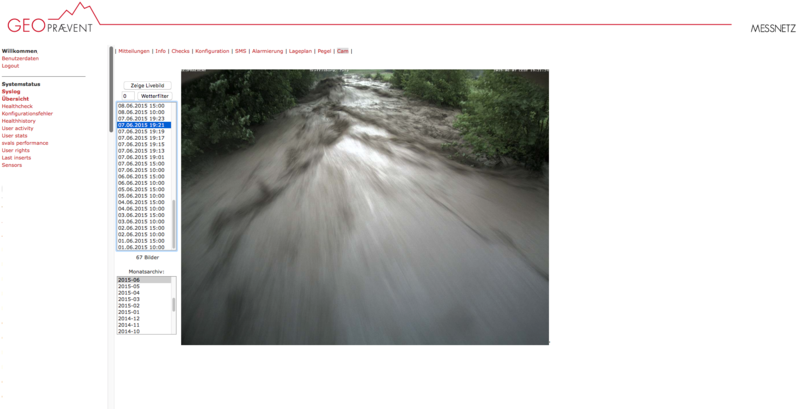 Furthermore, the water level data is transmitted to the Cantons’ hydrological data portal every ten minutes. 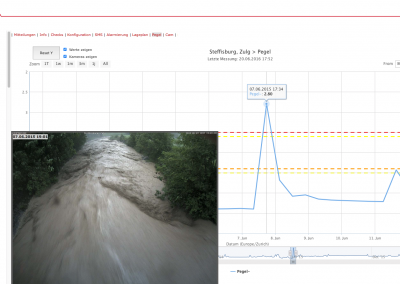 As soon as the pre-defined water level is surpassed, the system automatically sends prioritized SMS and voice calls to the Steffisburg fire and police departments, as well as the nearby Belp fire department. The early alerting makes it possible for authorities to take protective measures early on and prevent damage to property and infrastructure. 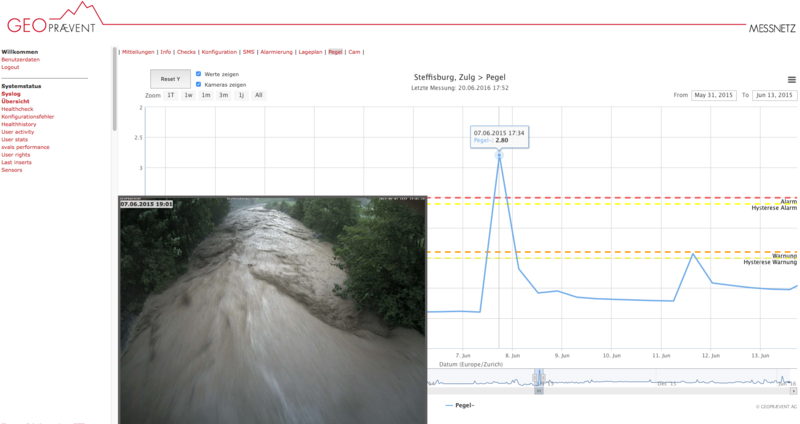 The danger of flooding along the Zulg river is well-known. Heavy thunderstorms and precipitation can cause the water level to rise rapidly. In some cases, the sun can still be shining in Steffisburg, and people along the river my not be aware of the danger at all. Not even the warning signs mounted along the river can prevent this. For many years, we relied on local observers in the upper areas of the catchment to sound the alarm. With the increased frequency and magnitude of such events, the municipality of Steffisburg decided to support the local observers with these modern technologies. 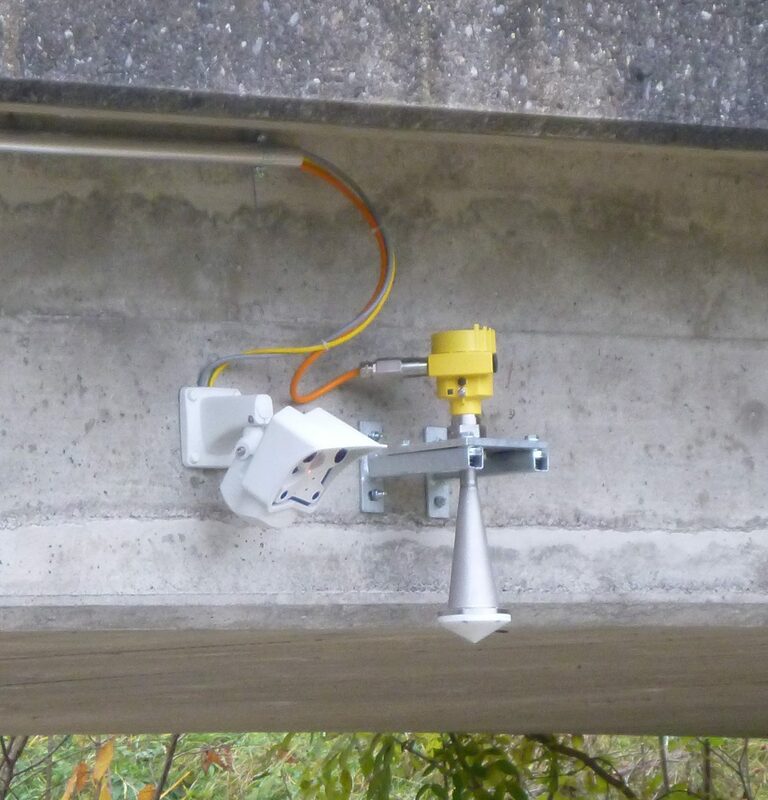 A radar gauge continuously measures the water level of the Zulg river. Next to the radar gauge, a webcam provides valuable images. The water level graph can be coupled to the webcam images. That way, the image corresponding to the position of the cursor along the water level graph is automatically shown. Of course, the webcam images can also be viewed separately. 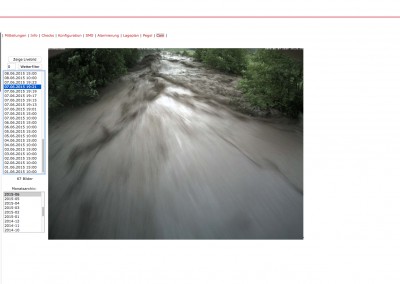 Time-lapse of the June 2015 flood. The sequence shows the time between June 7 at 10 am and June 8 at 3pm. Youtube Video of the 2012 flood (HallerJenzer Youtube Stream).